Connecting Research: The Forum · Reading tops rainfall charts: But how does downpour compare historically? 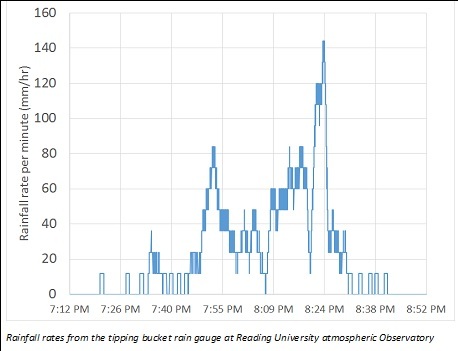 The University of Reading observatory publishes live and historic weather data. Its tipping bucket rain gauge got 38.6 mm in the storm, and 1.6 mm in the little shower 20 minutes before the big storm. The gauge experienced 35 mm of that total in 45 minutes, a phenomenal amount, averaging 47 mm/hr for three quarters of an hour. Let’s put that in perspective. How much rain is that? 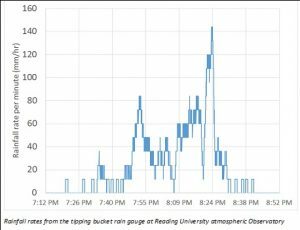 Well the University of Reading campus gets approximately 640 mm per year on average, so we had 5.5% of the annual rain in 45 minutes. You can see the one-minute rainfall rates in the figure below. There was a further storm, later in the night, that added to the total, leaving the University officially recording 45.1 mm in the 0900 (GMT) measurement. That was the wettest day since 18 August 2011 and the wettest July day since 22 July 1967 (just under 50 years ago). That 45.1 mm in the day is more than fell in half of the last 18 months. So a lot of lightning, a lot of water and a very big storm. 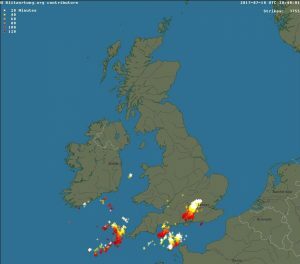 Thunderstorms can be very hard to forecast, and their exact timing and location are a particular challenge. For a few days, warnings had been issued of such events as yesterday, but they are not location-specific. 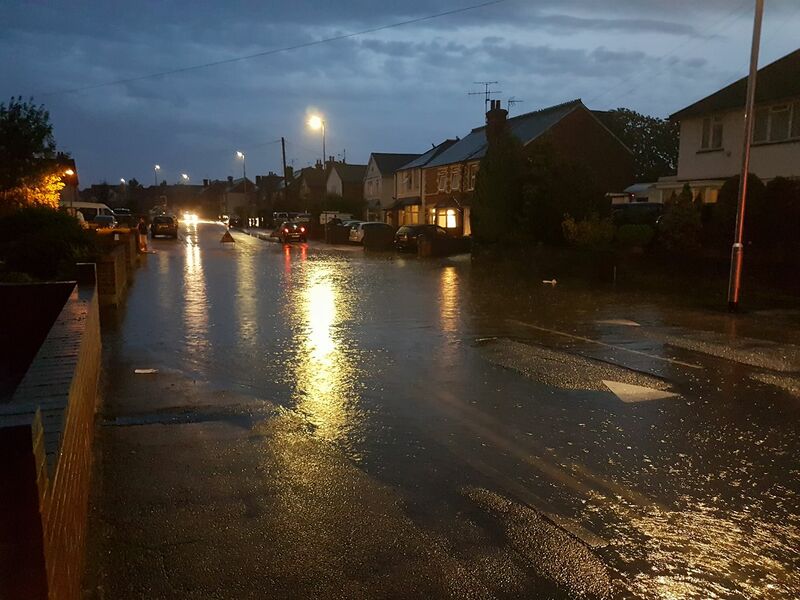 Ongoing research in the Flooding From Intense Rainfall research programme is investigating how better warnings can be made of such events, how to better predict the storms and then the flood impacts they have. Looking to the future, more specific warnings help emergency responses as well as the public. This is a fascinating article, thank you. There was a storm similar in ferocity on the night of 13th June 2014- I remember the date because we went on holiday the next day, which was also my son’s 3rd birthday. That was similar in the volume of the thunder but I don’t know about the rainfall! Other than those two, though, like you I’ve only experienced anything worse in the tropics. 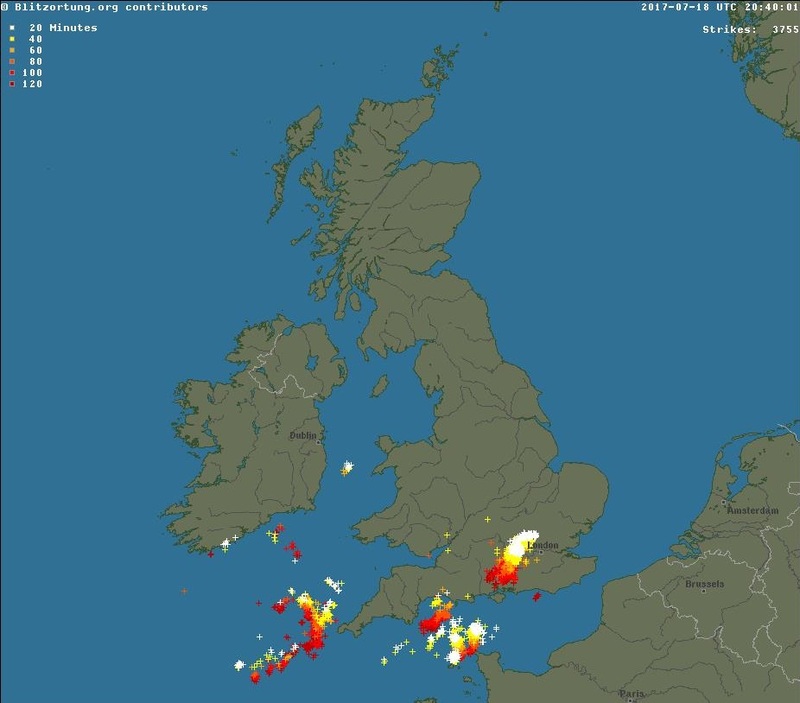 Theresa, MCSs (Mesoscale Convective Systems) – which this was, are not particularly unusual, especially in July, but where they hit is quite variable, and the real “meat” of them is localised, so a specific location (and of course therefore rain gauge) getting hit is unusual. A very interesting article. It actually puts into perspective the amount of rain (I doubt many people would be able to actually envisage what “47 mm/hr for three quarters of an hour” means in practice). You described it last night as “biblical”!! !